I bought myself a Cricut machine for Christmas this year. I’ve lusted after one for about three years, I finally had an Amazon gift card and no other more pressing priorities. It’s called a Cricut Explore Air, and it’s basically a die-cut machine. You can precision cut designs out of any material more flexible than posterboard. 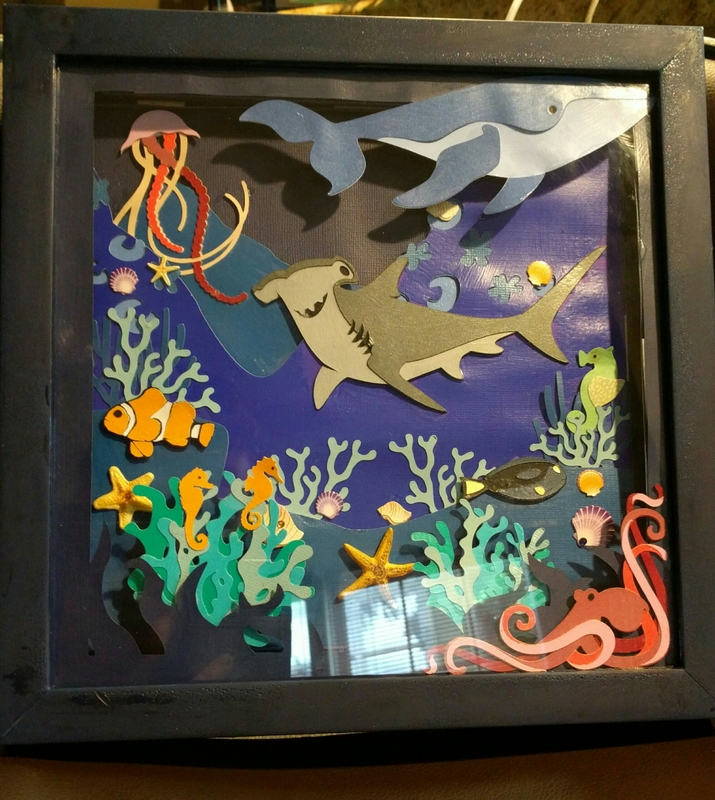 Since I actually really do like die cutting as a hobby, I will admit that there was more to it than just showing off for my fellow moms. I did the overwhelming majority of the decorations for Chloe’s birthday party. I’ve made some cards. 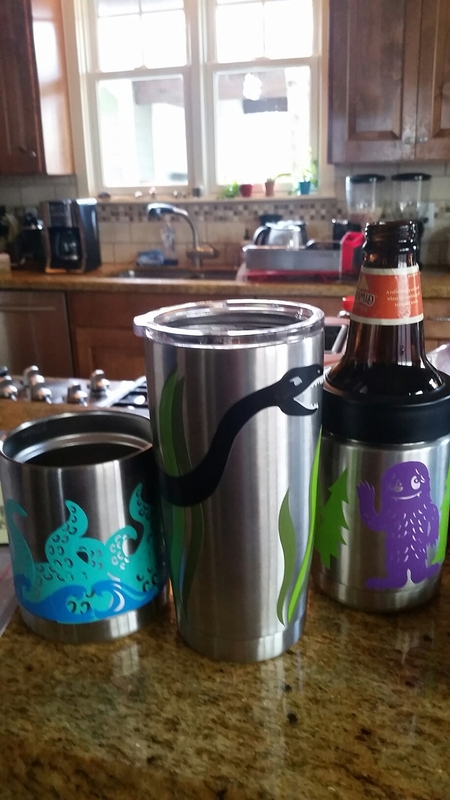 I created a whole series of Yeti drinkware with urban legends depicted on them. However, all of this was minor compared to the stakes this time of year, when everyone pulls out their A-game: Teacher Appreciation Gifts. Challenge, accepted. I’ve been experimenting with dioramas, and so I decided Chloe and I would design a diorama for her kindergarten teacher. Topics were proposed and rejected. 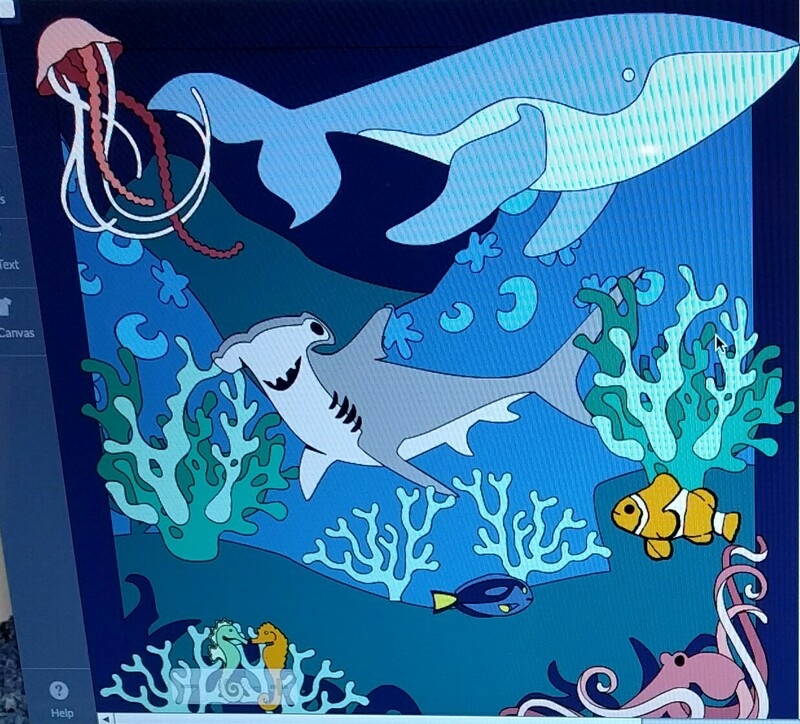 We settled, finally, on an undersea theme. It took the two of us about an hour to design. It took me ~20 hours to cut and assemble. Some of the more complex cutouts. Me: Sorry we missed actual teacher appreciation week. We made this for you. Teacher: Oh wow! This is great. Thank you. THAT MOM**: Wait, YOU MADE THAT? THAT MOM: Oh my god. OH MY GOD! All those times I set up group play dates for 3:00 in the afternoon on weekdays! And judged you for the amount of time your child bought lunch! And judged the nutritional choices on the bought-lunch tray! All of the time I spent theorizing that you didn’t breastfeed! All of that has just melted away under the weight of the fact that you can do THIS. What ended up happening was quite different. I finished the diorama two days early, but I still fussed with it last night trying to get it cleaned, getting Chloe to sign her name to the back, and wrapping it in the color-coordinated tissue paper I bought yesterday at Kohls. I cricut’ed a matching card (it was darling and featured a jelly fish). In short, I would say that I spent a decent amount of time staring at it once it was in the frame. Chloe and I proudly walked it down the hall to the classroom. The teacher promptly placed it on the nearest table and opened it. First, a win. She was delighted enough to pick it up and examine it closely. At which point I notice that there is a BEER BOTTLE CAP covering the jellyfish in the top left corner. Specifically a Devils Backbone Real Ale cap. Me: Oh my god. THAT is not supposed to be there. The Teacher: *laughing hysterically* Well it certainly looks as though you had a relaxing weekend. Me: Hey. Listen. I have, in my day, contributed more than my share of discarded beer caps. Not this weekend though, that’s not mine. The Teacher: Oh my god this is the funniest thing that has ever happened to me. Me: *dying inside* Well, you’re certainly going to remember getting it, I tell you what. The other kids in class: *Gathering Around* Mrs. G, there’s a bottle cap stuck in there. There were no other parents in the room. The teacher and I politely agreed that she could probably handle opening the frame and removing the bottle cap. I left. Upon reflection, I am forced to admit that my attempt to be Pinterest Mom will always be diluted by my innate Bridget Jones’ Diary self. Also, I realize that all of this is a hard lesson in not trying to avenge millennial parent-on-parent violence with paper craft schemes. Next time, though, I’m going to nail the whole scene. Just you watch.